Sunshine and relaxed golf in the foothills of the Sierra Nevada in a tranquil, yet beautiful setting in Spain’s sunniest province, Almeria. We are thrilled to return to this stunning golf resort - a firm favourite with Solo’s golfers. Valle del Este’s desert setting is spectacular, with rugged mountains in the background and the sea sparkling in the distance. The hotel has recently been refurbished, and the course has been improved, so we definitely recommend a visit. 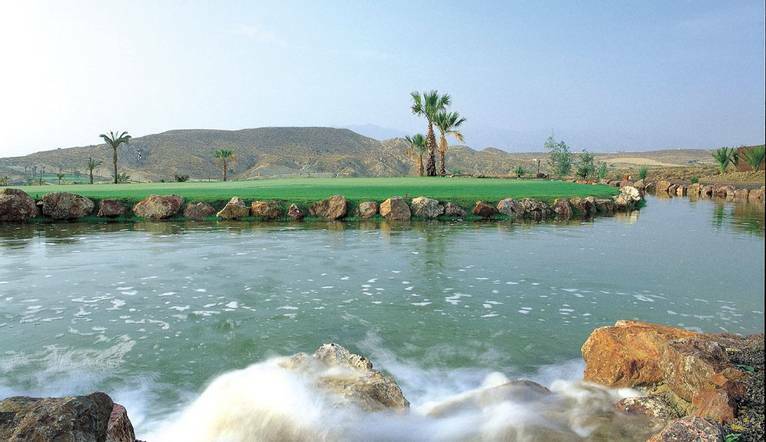 Valle del Este has a fascinating variety of distinctive holes that are sure to test every facet of your game. The wide fairways may look tempting, but large bunkers and three lakes lie in wait to trap the wayward shot. The course has been carved out of the desert, and is beautifully integrated into the barren rocky landscape using the indigenous vegetation, which gives the course a similar feel to the American courses in the Arizona desert. The stylish Valle del Este Hotel provides a relaxing base for this holiday. The hotel has an outdoor swimming pool and pool bar, buffet restaurant and pub. Other amenities include a gym, sauna, hairdresser and spa with beauty treatments, massage, hydrotherapy and health treatments (extra charge, bookable locally). The spacious rooms have private terraces, with views over the golf course and/or the coast. They are equipped with satellite TV, minibar, air-conditioning,telephone and safe deposit box. The transfer time from Alicante Airport to our hotel is approximately 2 hours, depending on weather and traffic. Please advise our Reservations team of your handicap at the time of booking, and if you have a certificate please ensure you take it with you on the trip. This enables the Tour Leader to assess everyone’s ability, so that rounds and competitions can be organised fairly.